If you have ever had a crown placed over a tooth before, you know how drawn-out the procedure is. First the trip to the dentist to have impressions taken and a temporary installed. Then a two-week wait while the permanent crown is made. Then another trip to have the actual crown placed. If it doesn’t fit right, then another wait and another trip to the dentist. Now, what was a minimum of a two-week ordeal has been reduced to a one-hour office visit. With CEREC™ technology, we can design and create a perfect-fitting crown in just about an hour with the aid of a computer. There is no waiting period or return trips to the dentist. You do not need to have a gooey impression taken or a temporary crown placed. Patients love how much easier a crown restoration is with this system. The procedure begins by painting the tooth with a reflective powder. A picture is taken with a special camera, and the image is displayed on a screen so we can design the restoration. 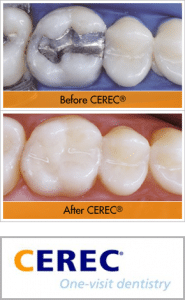 CEREC then mills the restoration to perfection. Our dentist bonds the crown to the tooth structure, and that is the whole and easy procedure.